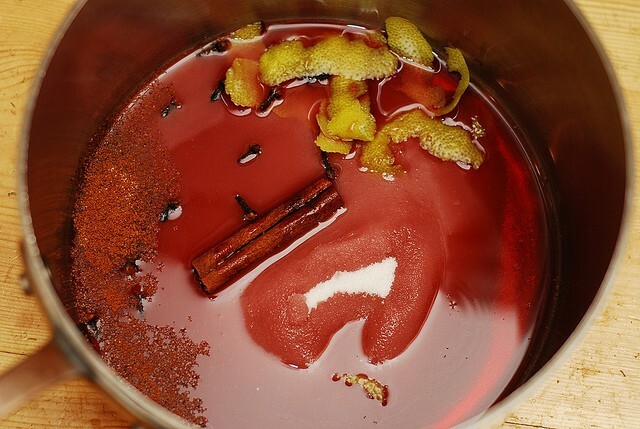 Mulled Red Wine – spiced, warm drink that is made with red wine and spices. Perfect for cold Winter nights. 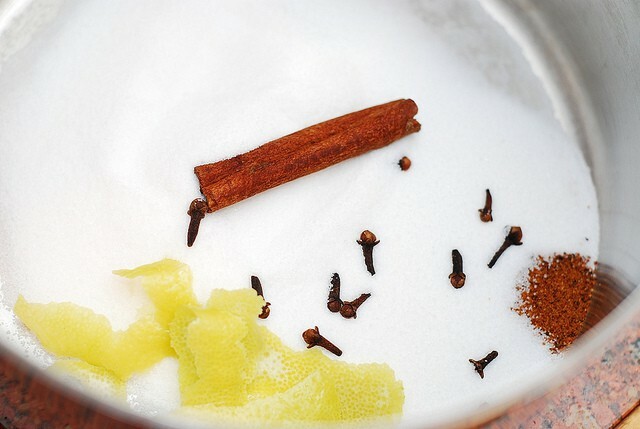 Spices include cinnamon, whole cloves, nutmeg, lemon peel. Cold winter night + hot spiced wine has been an inseparable combination for me as of late, since I discovered mulled wine (or, Gluhwein, as it is called in German) several years ago. 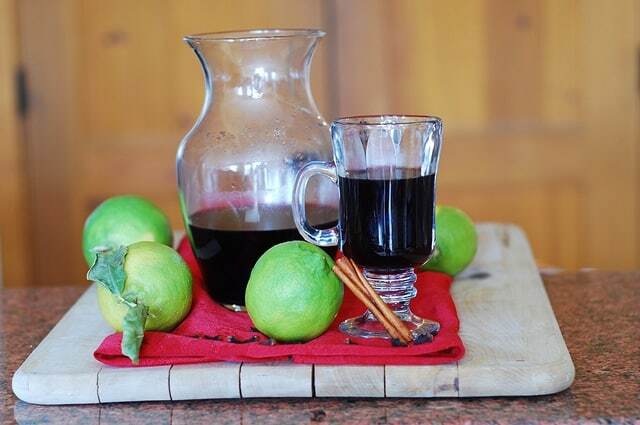 Mulled wine is a traditional winter drink popular in Europe around the holidays. It is also a very popular cocktail at Hanukkah parties. 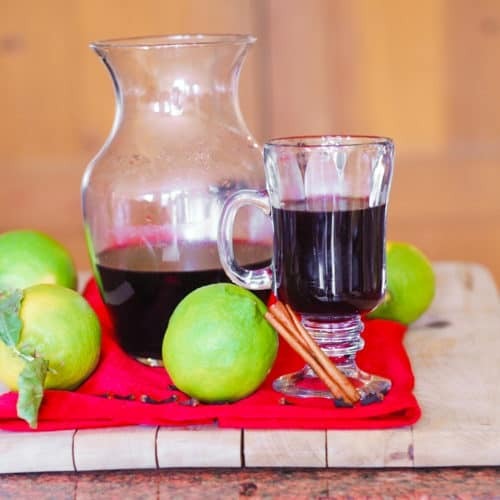 It’s surprisingly easy to prepare mulled wine at home, all you have to do is to heat red wine and spice it up with Cinnamon sticks, cloves, orange or lemon peel, sugar and other spices. Comforting hot drink for a cold winter night is ready! 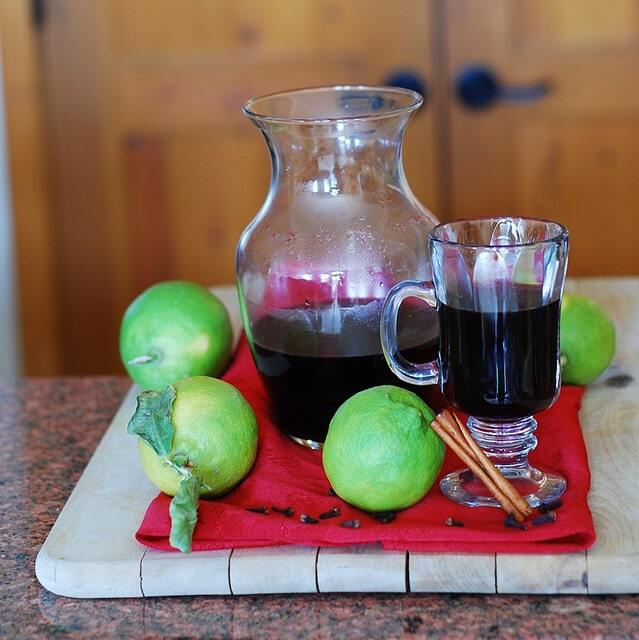 Mulled Red Wine - spiced, warm drink that is made with red wine and spices. Perfect for cold Winter nights. Spices include cinnamon, whole cloves, nutmeg, lemon peel. 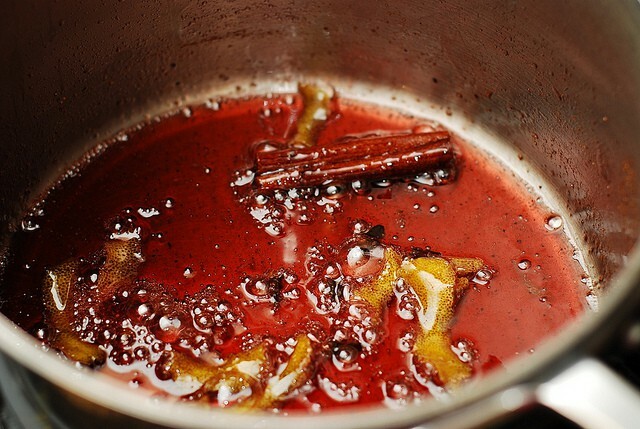 Place sugar, cinnamon stick, cloves, nutmeg and lemon peel in a large sauce pan. Pour 1/3 cup wine over it (just to cover it) plus 1/3 cup water. Squeeze juice of half a lemon on top. Bring to boil, mix all ingredients well, making sure all sugar dissolves. Simmer on low boil, covered, for 15 minutes (to infuse all flavors together), until the liquid reduces in about half and the syrup forms. The boiling syrup will have a lot of small bubbles and will be visibly reduced. At that point, pour the rest of the bottle of wine, bring the whole mixture almost to boil, mixing well. Just as the mixture is about to boil, turn off heat and let it sit covered for about 1 hour to further infuse flavors. 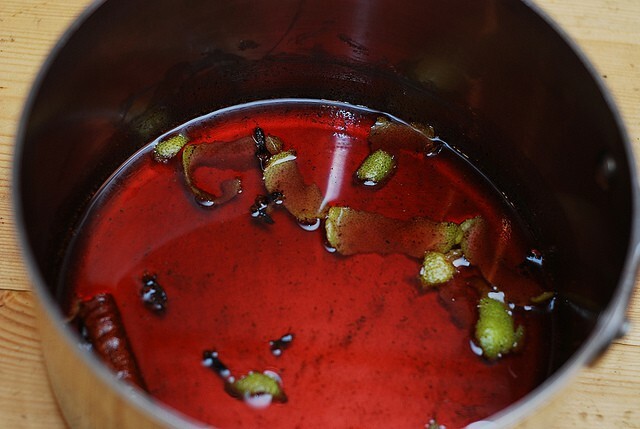 After 1 hour, sift the liquid to get rid of cloves, lemon peel, etc. Gently warm up without boiling and serve. Glogg is also very popular in Denmark (where my husbad is from), I loved it. I made it once here at home, but most days, even in the winter, it’s too warm to drink a warm alcoholic drink. Think headache. Glühwein reminds me of the Christmas markets in Germany. Walking from booth to booth on a cold winter night with Christmas music playing everywhere. Traditional handmade crafts are sold. Rides for the kids and adults… and of course, the delicious food. Glühwein is inseparable with Christmas markets for me. Like you said, it will warm you on a freezing cold night. And the smell is just delicious… Thank you for sharing this recipe. I need to give this a try. 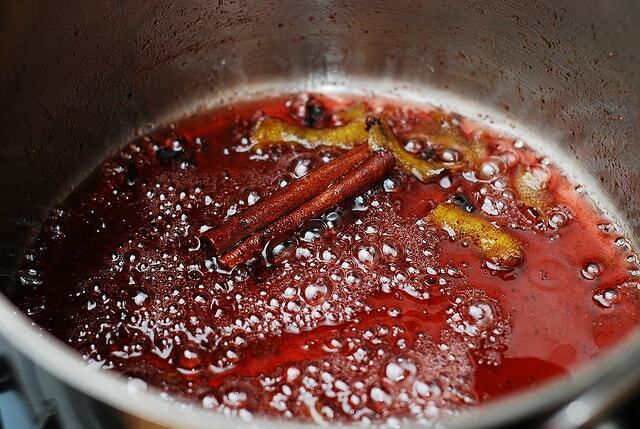 My husband has been talking about making mulled wine for years now but we’ve just never done it!